The Boeing Co. plans to be ready to fly commercial space taxis from Cape Canaveral to the International Space Station by 2015 and soon will decide where the spacecraft will be manufactured and assembled, officials said Thursday. Designed to launch on United Launch Alliance Atlas or Delta rockets, or perhaps even SpaceX Falcon 9s, the spacecraft also are destined to fly to a commercial space station being developed by Bigelow Aerospace in Nevada. Four test flights — including three from the Space Coast — are targeted to launch in late 2013 and 2014. Florida is competing with Alabama, Texas and Nevada for various parts of the spacecraft work. The number of jobs is still to be determined. Decisions on where work will be done are expected within three months. “We’re going through the process of deciding not only where we will do the manufacturing, but where we will do the mission operations, the training, the sustaining engineering, the program management — all aspects of the program,” said John Elbon, Boeing’s vice president for commercial space programs. Although the survival of the program depends entirely on uncertain government funding — Boeing hopes provisions will be made for it in upcoming Congressional appropriations bills — the company is already designing and testing parts of the new capsule under an $18 million Commercial Crew Development contract with NASA. “We are cutting metal right now, and we are making a lot of progress,” said Keith Reiley, Boeing’s commercial crew development program manager. A demonstration version of the capsule that will be used in pressure tests is now being assembled at Boeing’s Advanced Network and Space Systems Division in Huntington Beach. If there are no funding hiccups and all goes according to plan, Boeing hopes to develop the ship on a tight timeframe: a launch-pad “abort test,” a high-altitude abort test, and a crewless flight test by 2014, with the capsule ready to fly in 2015. The new spaceship would only be for use in low-Earth orbit, or “LEO,” and should be viewed as a complement, rather than a competitor, to NASA’s proposed Orion spacecraft, which could be used for deep space exploration, the managers said. This is very significant for several reasons. It’s a sign of how seriously Boeing is taking the commercial orbital market. That’s a strong endorsement of the approach being taken by the Obama Administration. And it’s an indication that NASA’s commercial space funding levels — at least in the Senate’s plan — might be just enough to get the sector going. 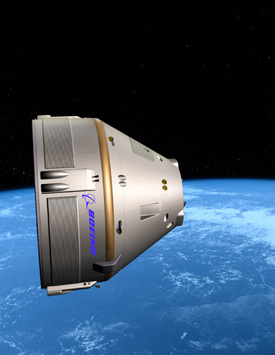 Boeing’s proposal sails above nearly all the criticism that has been leveled against commercial crew. Experience? Boeing’s got it. Financial stability? Ditto. Reliable rockets? ULA’s boosters are tried and tested. Viable market? We think so. Will it compete with Orion? No. What other objections are there? You could argue that Bigelow has never flown humans in space and that the venture could fall short financially. That’s true. All commercial ventures are risky. But, it’s a very serious, well-funded company that has sent two prototypes in orbit and is working closely with one of the world’s leading aerospace companies, Boeing. It’s a great combination of old-line aerospace expertise and NewSpace entrepreneurial drive. It will be very interesting to see what happens with NASA’s funding. If the space agency has enough commercial space money in its budget, it could potentially fund Boeing’s capsule, upgrades to ULA’s rockets, and an escape system for SpaceX’s Falcon 9/Dragon combination. That would fulfill the Administration’s goal of having multiple, redundant access to space.